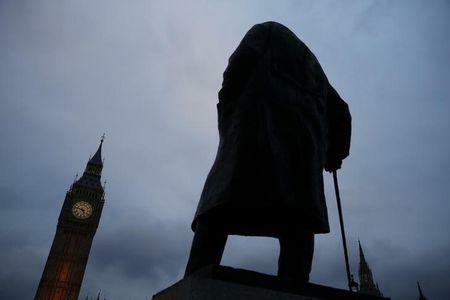 LONDON (Reuters) - A newly unearthed essay by Winston Churchill shows Britain's wartime leader was uncannily prescient about the possibility of alien life on planets orbiting stars other than the Sun. The 11-page article was drafted on the eve of World War Two in 1939 and updated in the 1950s, decades before astronomers discovered the first extrasolar planets in the 1990s. Yet Churchill pinpointed issues dominating today's debate about extraterrestrial life, proving that the former prime minister "reasoned like a scientist", according to an analysis of his work published in the journal Nature on Wednesday. The hunt for life on other worlds has taken off in the last 20 years as observations have suggested the Milky Way alone may contain more than a billion Earth-size planets that could be habitable. Churchill was already thinking along similar lines nearly 80 years ago, writing that "with hundreds of thousands of nebulae, each containing thousands of millions of suns, the odds are enormous that there must be immense numbers which possess planets whose circumstances would not render life impossible". He also honed in on the importance of liquid water for life, saying that a suitable planet would have to be "between a few degrees of frost and the boiling point of water". Modern scientists are busier than ever looking for signs of life in such environments, both in our own solar system and in the wider universe. So far they have found nothing. Churchill's essay was probably intended as a popular science piece for a newspaper, although it never appeared in print. The famous polymath had already written similar science articles for newspapers and magazines, including one on fusion power in 1931. The type-written essay entitled 'Are We Alone in the Universe? ', was uncovered last year in the archives of the U.S. National Churchill Museum in Fulton, Missouri, and passed to astrophysicist Mario Livio for expert examination. In his analysis in Nature, Livio praised Churchill's clear thinking, as well as his support for science as a tool of government policy. Churchill was the first prime minister to employ a science adviser. "At a time when a number of today’s politicians shun science, I find it moving to recall a leader who engaged with it so profoundly," Livio wrote. Churchill's vision of life on Earth in the first half of the 20th century, however, was far from rosy. "I, for one, am not so immensely impressed by the success we are making of our civilization here that I am prepared to think we are the only spot in this immense universe which contains living, thinking creatures, or that we are the highest type of mental and physical development which has ever appeared in the vast compass of space and time."